The Miami Dolphins made a rare appearance on the nationally televised Thursday night football game versus inner-division rival and nemesis of late Buffalo Bills. Each team came into the game with a record of 5 - 4, and both teams NFL playoff lives were on the line. This was especially true for the home team Dolphins who had already lost the previous head to head match-up in Buffalo. A Miami loss in this instance literally spelt doom for the teams playoff hopes, it have been a second straight loss with a trip to Peyton's Place looming. This was a must win for the Dolphins, a loss would have meant they would lose all wild card playoff tie breaker scenario's to both the Chiefs, and Bills. If it were to come down to said three teams? One would think that the network would inauspiciously highlight the home teams first time in ten years brightly colored entrance to the field? Miami wore teal uniforms from head to toe for the first time since the days of Ricky Williams. Low and Behold, the league's Rodney (Dolphins) Dangerfield get no respect and the network cuts to commercial as Miami approaches the tunnel's exit. The analysts (for the most part) dog the Dolphins during the pregame, and continuously suggest through halftime that the visitors will do something mystical to win the game. Miami's Men Of Teal Prevailed 22 - 9! The Victory propels the Dolphins to 6 - 4 overall with a 5 - 2 Conference record which is presently second best to only Denver's present 5 - 1 AFC head to head status. The loss drops Buffalo to the AFC's eleventh seed of sixteen teams, where Miami might have ended up. Instead. Miami is hot on the tail of the current 3rd, 4th, 5th, and 6th seeds, whom with losses this coming weekend the Dolphins can pull even with, if not ahead of. Your Miami Dolphins have now won five of their last seven games with only two last second heartbreak losses to powerhouse NFC offenses detouring the flow. The Bills have one of the leagues best defensive fronts and humiliated the Dolphins 29 - 10 during the week two head to head in Buffalo. In week 11 (due to injury) Miami was forced to start three offensive lineman at positions that they hadn't started at the previous week, (if ever). Yards were hard to come by, and it seemed that every time the Dolphins made a prosperous play something would happen to nullify the advantage. It appeared as though every first half inch gained for the Dolphins was highly contested while Buffalo was rhythmically running around on the wide open plains. On top of that. The Dolphins tried their best to lose this game in the first half with a fumble, and penalties that killed the few momentous Miami moments. Jarvis Landry returned the opening kickoff 37 yards, and a return team holding penalty put the ball at the home teams 12 yard line. In order to nullify the Bill's fearsome front, Miami started out with the quick short passing game on the series first three plays that gathered 25 yards, and drove to the visitors 33 before a first down sack of Ryan Tannehill at the Bills 45 followed by negative 2 yard rush attempt. With a 3rd down and 24 on Miami's opening possession the game was already looking too much like the previous meeting between the two teams, but a perfectly thrown short pass, and one handed grab up the seam to tail back Damien Williams in stride netted 32 yards for a first down at Buffalo's 15 yard line. Another pass to Williams took it to the nine while a penalty on the next play pushed the ball back to the 19 where the series stalled. Tannehill went 8 of 9 for 80 passing yards to five different receivers, and the Dolphins kicked a 38 yard field goal after controlling the opening possession for 8:20 on 14 plays for 68 net yards as Miami took a 3 - 0 lead. Buffalo ate up all but 13 seconds that remained of the first quarter with a series of 14 plays for 67 yards and a 33 yard field goal of their own for a 3 - 3 tie. 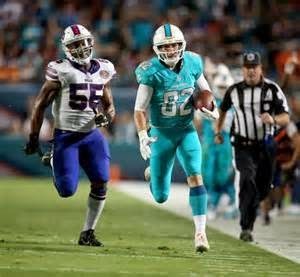 Miami's Lamar Miller rushed for forty yards (7, 33) on two plays, and Brian Hartline caught a pass for 17 yards to the Bills 14. On first down a scrambling for yardage Tannehill was stripped of the ball from behind for Buffalo's first forced turnover of the day which ended the momentum gathering Dolphin drive of 67 yards in six plays for zero points. Ryan's fumble 2:10 into the second quarter was his first in over a year (19 games), it was the Dolphins fifth red zone turnover of the 2014 season (most in the league), Arrrghh! The Bills march 85 yards on 17 plays in 9 minutes and 24 seconds to kick a momentum swinging field goal. The Dolphins aren't able to answer on 9 plays of 39 yards to the visitors 41, punts, and the Bills take a knee to end the first half of play with a scoreboard advantage of 6 - 3. Tannehill is 14 of 18 for 136 yards with a fumble, and is sacked twice, Buffalo's Kyle Orton has yet to be swarmed. Miami has totaled 174 yards with 53 rushing to Buffalo's 151, and 51 on the ground. The Dolphins have converted 50% of their 3rd down plays while Buffalo has been successful 75% of the time. Miami is losing the time of possession (13:37 to 16:23), and turnover (0 - 1) battles. 2014's Miami Dolphins (for the most part) have been a slow starting, feel the opponent out, first half counter puncher. Unlike the 2013 Dolphins. Miami's o14 team has become a third quarter terror in leading the league at half time adjustments that have resulted in the leagues highest third quarter scoring output, as well as league leaders in allowing the opponents lowest rate of points produced. This Thursday Night Debut would be no different! Buffalo received the third quarters opening kickoff, and Miami's defense forced a three and out of 3 yards gained. The Dolphin offense gains a first down on three plays before a false start penalty, and third sack of Tannehill leads to a second and 25. Miami punts two plays later as Buffalo takes possession at their own 23 yard line. The Bills drive 49 yards in eight plays to the Dolphins 28 for a 46 yard field goal, and 9 - 3 visitors lead. Now the Dolphins are pissed off with 6:26 third quarter ticks of the clock to go, and are suddenly inspired to showoff their second half prowess. From their own 20, Miami drives 80 yards on 9 plays in four minutes 8 seconds. Lamar Miller rushes the ball three times for 21 yards while Tannehill completes 5 of 6 for 59 yards to three different receivers (Landry 11 & 5, Charles Clay for five, and the biggie to Hartline on a crossing route catch and run of thirty-one yards) to the Buffalo 16. Ryan caps the drive with a brilliant fake pitch left, roll out right to find a wide open Brandon Gibson in the end zone for the games first TOUCHDOWN, and Miami lead of 10 - 9. The visitors second 3rd third quarter series goes three and out for negative 20 yards, and ends on a second and twenty intentional grounding penalty from within the end zone for a Dolphin defensive safety, and two more points for the good guys at 12 - 9. with 57 third quarter seconds remaining. Mann Ohh Mann the momentum had swung, and things are looking good! The Dolphins have again outscored the opponents in the third quarter, this time by a score of 9 - 3, and they are about to get the ball back due to the forced safety. Dooahh. Upon the free kick Jarvis Landry returns the ball 21 yards to the Miami 39 but bobbles away the Dolphins second turnover of the day, and the mirage of momentum has disappeared yet again. Buffalo is down by three points, and has a first down at the Miami 39 yard line. On first down they gain 10 yards for another first down at the Dolphins 29. Three plays later for minus one yard, and (two plays into the fourth quarter). Ex Dolphin Dan Carpenter was up to the tricks he excelled at while with Miami, in (turning momentum against the team he plays for) with a wide left field goal kick on Buffalo's attempted tie of the game. The Carpenters warped hammer keeps the game in Miami's favor at 12 - 9. From the Dolphins 29 Lamar Miller runs three times for 14 yards, Tannehill completes a 12 yard pass to Clay, and Miami gets a 24 yard defensive pass interference upon Mike Wallace called in their favor for a first down at the Bills 13 yard line. Daniel Thomas rushes for five yards on first down, on second down Ryan Tannehill connects with Jarvis Landry for an 8 yard TOUCHDOWN, and Miami Dolphins 19 - 9 scoreboard advantage 2:25 into the fourth quarter. During a 5 minute 43 second span between the 2:18 remaining in the third quarter mark, and 3:25 into the fourth quarter, The Miami Dolphins scored 16 unanswered points! Buffalo had three fourth quarter possessions for 33 total yards on 13 total plays. While harassing Kyle Orton over the majority of the games second half, the Miami defense accrued it's only two sacks on the visitors final two series of four plays each. Your Dolphins sealed the game with a 32 yard field goal that took place between the Bills final two possessions that were both turned over on downs, and THE MIAMI DOLPHINS WIN 22 - 9! Miami converted twenty four first downs to Buffalo's thirteen, 125 rushing yards to 54, 240 passing yards to 183, for a total yardage advantage of 330 to 237, and held possession of the ball for nearly 5 minutes more than the opponent. Lamar Miller had 15 rush attempts for 86 yards. Though he was sacked five times by Buffalo's vaunted front seven, Ryan Tannehill went 26 of 34 for 240 passing yards, with two touchdowns (Landry & Gibson), and zero interceptions with yet another game above the century mark, and overall quarter back grade of 114.8. Tannehill has 17 touchdowns to 7 interception's on the year. Injured Courtland Finnegans replacement Jamar Taylor led the Dolphins in tackles with seven solo, and shinning again was Earl Mitchell and Olivier Vernon with sacks of the opposing quarterback. THANK YOU FOR A MUST WIN THAT ENDED IN VICTORY FORMATION!! YEEEE HAAAA, WOOOO HOOOOO, GIGGITTY! !